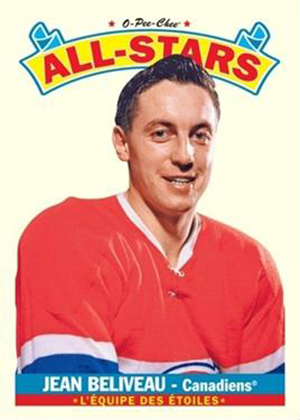 Purchase HOBBY packs of 2012-13 O-Pee-Chee NHL and collect the empty wrappers. 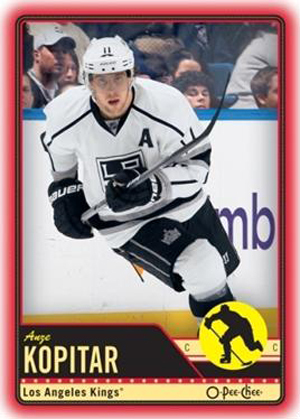 Submit groups of 50 HOBBY wrappers from 2012-13 O-Pee-Chee NHL to an Upper Deck Certified Diamond Dealer (CDD) in Canada. The CDD will send in groups of 50 HOBBY wrappers for their customers to Upper Deck’s Canadian Fulfillment Center. Shipping information will be provided directly to Upper Deck’s network of Certified Diamond Dealers in Canada. Upper Deck will send one six-card pack for every 50 HOBBY wrappers received consisting of five red-bordered O-Pee-Chee parallel cards and one All-Star card. CDD will contact their customers to come pick up their packs when they arrive back at the shop. Since O-Pee-Chee is a brand with strong Canadian roots, this promotion will only be offered in Canada. Individual collectors cannot send their HOBBY wrappers in, they must be sent in through an Upper Deck Certified Diamond Dealer in Canada. These packs are limited and this offer is good while supplies last. Upper Deck will issue a “last call” warning when inventory on these packs nears depletion. There are no charges tied to receiving these packs from Upper Deck although some shops may request a nominal shipping and handling fee to send the wrappers in to Upper Deck’s Canadian Fulfillment Center. Packs have been produced and are available for immediate shipping. Canadian collectors can attempt to complete a special 600-card red-bordered parallel set of 2012-13 NHL O-Pee-Chee just by submitting hobby wrappers from the product to their local hobby shop. The 50-card All-Stars set will be difficult to complete with just one of the cards coming in each six-card wrapper redemption pack. Upper Deck really wants to see collectors chase this set so grab those wrappers and get after it! This sounds terrific, and we already have one guy in for a case and looking forward to the redemptions. It doesn’t say anywhere I saw, though — this is for hobby packs only, right? Thanks for the update, Chris — we are VERY much looking forward to both participating in this promotion and selling a ton of 2012-13 O-Pee-Chee this year! Chris, been a while since I talked with you, hope all is well. I do have to ask though, why is this limited to Canada? That is disappointing to hear as a US purchaser of hockey products! This is one of those few good old style products that you open to chase and build the set, not chase after some $1,000 rookie card, etc, just good old time set building. Shame everyone isn’t able to get in on the wrapper redemption program. This is a great idea. We have seen a surge in sales ourselves, and the buzz about the redemption packs are huge. We have a huge box of wrappers going out soon, and more coming in everyday. As a CDD, I think these promotions are great for the hobby. It makes set collectors have another hard to get set to finish, but one that will encourage trading , old school style. I know that we are going to have a very special trading night when our customers packs start coming in, so they can trade with each other, just for this set. 1. O-Pee-Chee is a brand with strong Canadian heritage that many Canadians think of as “their” set. To play up that heritage and encourage our Canadian audience to get behind this program, we felt having it exclusive to Canada would be the right way to start it out. 2. Since it is a new program, we want it to be successful so it can potentially grow in the future. The best way to have a successful hockey program is to run it through Canada where the collector base is so passionate. We believe it will be successful and as the product and program generate more buzz, potentially we can look to bring it to the U.S. in the future. 3. Lastly American collectors who want these cards will be able to track them down at trade shows, trading through online communities and purchasing them online. 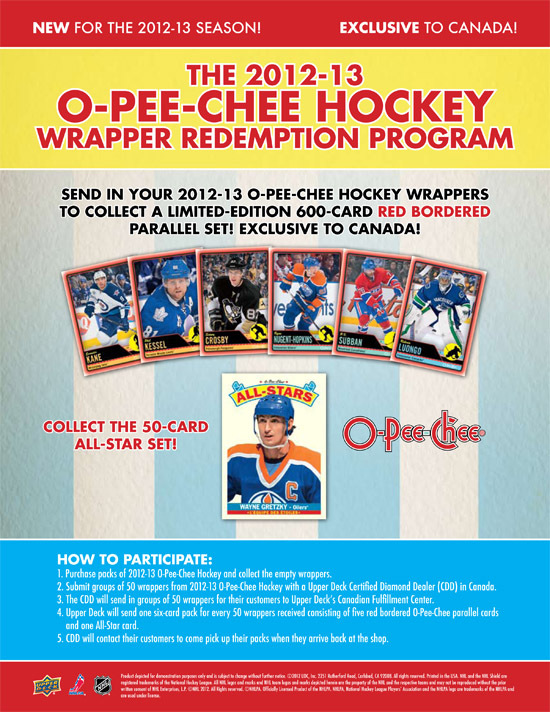 We could even see American collectors of O-Pee-Chee sending wrappers north to Canadian collectors. We think encouraging interaction between the two countries could have benefits. How can I tell if my LCS is a Certified Diamond Dealer? Is there a list of included Canadian Hobby Shops? I was excited about this, but 50 packs is too many. I won’t be buying that many packs. I would maybe do 10 packs. It is nice to see them promoting the local card shop though as a place to go to make this happen. Same question as Bill’s: where can we find a list of Certified Diamond Dealers in Canada? Thanks. Is there an expiry date for this promotion? It took me a few weeks to find a CDD within reasonable driving distance and the dealer said he thought the promotion was over. Hi Chris, while I thought that the Upper Deck O-Pee-Chee Wrapper Redemption Offer would be a big deal it turned out to be rather disappointing. Sales of O-Pee-Chee in our store didn’t exceed last year and those dealers who sent wrappers in for redemption have complained of several weeks of waiting for any return or reply. Less packs per box and higher pricing then last year left collectors feeling taken advantage of. Just thought you should know. Bill & Alan, where do you guys live? We’ll be happy to share a list of shops in your area or you can call us at (800)873-7332. Shane, we do still have enough packs where we will not be ending it in the near future. We planned to hopefully have enough to last for one year from the release and we are right about on target there. So please send your packs in as it is still running. Doug, the cost per card has actually decreased in comparison to last year. Which dealers had issues with delivery? We haven’t heard those issues but would be happy to review. You can email that to me directly at chris_carlin@upperdeck.com. We have received quite a bit of different feedback on the promotion saying it did help and considering we have received in over a quarter of a million wrappers, it would appear it has been quite successful. We appreciate your feedback however. About the red border wrapper redemption cards. This 600 card set at 5 cards per pack Plus one all-star (after sending 50 wrappers) would take 16 cases (not boxes) of wrappers to build. I don’t know about the rest of the collectors but I can barely find the mmoney to buy a case of cards, let alone 16 cases. Not to mention the postage and handling for each shipment of 50 wrappers. Too rich for my blood. My 2 cents – 2012/13 Hockey. I recently (February 2013) bought a case of Hobby O-Pee-Chee and a case of Hobby Black Diamond. Once I opened a box of the OPC, at first, I wanted to take the other 11 boxes back to the card store to have them resell them. Each card looked like it was put in a frame and the sun then discolored the rest of the card. Sorry for the di-hard OPC fans, but after all it is only my opinion. However, after a bit, the OPC kind of grew on me as I remember this type of card from the early 70’s when I first started buying sports cards. Although then, we were flinging them towards a wall at school on recess, and who ever got their card closest to the wall took all the cards thrown. Not so great for the cards. I then continued to open all 12 boxes to get the wrapper redemption going. Now that I am sorting the commons it is a real drag. Each is getting a sleeve then sorted into the 600 card set. Ugh. I must say that the OPC I bought in 99/2000 were a lot more fun to work with and the chase cards were much better (Stanley cup refractors etc.). The Blank Diamond cost 1/3 more for half the amount of cards, but what a difference in terms of satisfaction when opening and sorting. I got some nice chase cards and the quality is so much better. I got 15 sets of 100 in the Black Diamond with a few nice pulls. In 99/2000 I got a Eric Lindros triple stick piece of history with a ‘1/1’ on it in sharpie. Since the Paul Kariya triple sold for $1100 in 2000, I was very happy with that pull. Not sure how that compares to the emerald quad autograph Domenik Hasek I got this year but I am completely satisfied with the Black Diamond this year. I just bought a box of Hobby Artifacts yesterday and am considering the case purchase. Way less cards, but amazing pulls, the only thing I did not like was the redemption cards, and after having issues trying to set up an account and finally putting in the redemption number, the comments I got for the two cards was: “Waiting for the athlete to sign, be patient” and “will not be made until after the season starts”. That kind of takes the thrill away. If you want the chase cards without a ton of commons to sort Artifacts is for you. Sorry, but for me the OPC are a “do not buy”. I will buy a few sample packs each year to determine if the case purchase is worth it or not. John, your wrappers were received and are scheduled to ship this Friday. We have these shipped out once a week.